Branching out on your own this holiday season? We’ve got easy tips for first-time homeowners. We all have fond memories of the holidays. Maybe it was the way Mom decorated the mantel with her prized collection of nutcrackers or the way she set the table with her favorite kitschy china. Maybe one of your fond memories was hanging out with Dad to set up the larger-than-life plastic snowman family on the lawn. 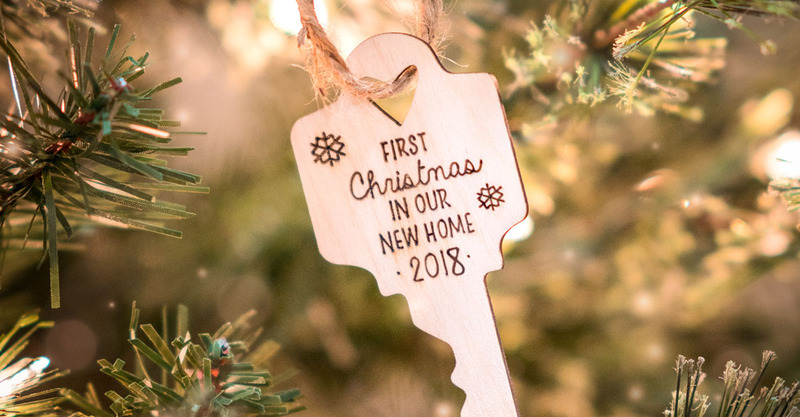 Now that you’re looking at your first holiday as a homeowner, you’ve got a blank slate to create your own tradition. 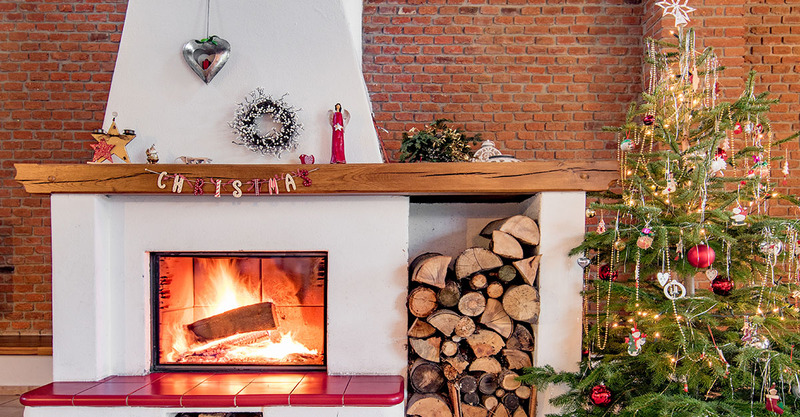 And from trees to trim, we’ve pulled together a little holiday inspo for you. Start with a tree. Any tree. A tree is an easy place to begin and, here are a few things to keep in mind, whether you’re going for artificial or real. First of all, measure the width and height of the space where you plan on setting your tree–and remember to allow extra height for your stand. Secondly, keep a real tree away from any sources of heat, since it’ll dry out quickly and drop its needles. Not only that, it could possibly become a fire hazard. Is non-traditional the new tradition? There’s a huge movement towards artificial trees and it’s not surprising–there’s a whole forest of fun to choose from, especially if you’re game for an over-the-top statement-making tree. Are you an early-adopter of pretty much anything new? If so, check out the candy-cane striped, pink-flocked or ombre-themed trees that are out there now. If your taste leans towards mid-century modern, why not invest in a vintage-inspired metallic tree? They’re back in a big way–from the original silver to more contemporary shades like gold, red and blue. For true minimalists, there are a variety of awesome wood and wire trees available. Not the adventurous type just yet? Then go ahead and opt for a realistic artificial tree such as a Douglas fir or a Virginia pine. They’re beautiful and timeless. No matter what type of tree you choose, the good news is that most are fairly easy to set up. They’re available in all different sizes and shapes, too, from 18-inch tabletop to 15-foot high, from super-skinny to wide. And since most come pre-lit, all you have to do is decorate…or not. Who knows, that gold-toned ombre-themed tree may not need a thing. Few things smell better than a freshly-cut tree and, before you head out to get one, here are a couple of additional tips to bear in mind. When you get your tree home, saw a couple of inches off the bottom so water absorbs easily. (No saw? No problem; ask the guy at the tree lot to cut it for you.) A freshly cut tree can consume a gallon of water in 24 hours, so check your stand daily and keep it filled. If you care for it properly, it should last about a month. When it’s time to take it down, check with your local municipality to see if it can be recycled. Many cities and counties accept trees (some will even pick them up curbside), turn them into mulch or wood chips, and then make it available to the public free of charge. As a first-time homeowner, that’s great news when Spring rolls around. 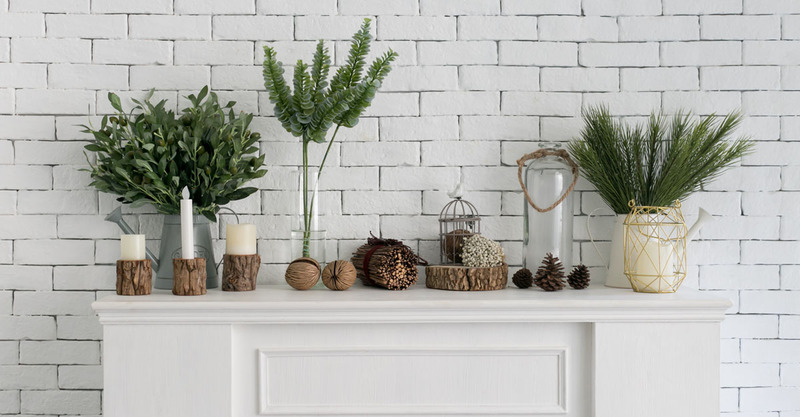 You may not have space for a tree, but you definitely have a wall to make something festive and tree-like on it. Instead of putting holiday cards in a drawer or in a pile somewhere, create a wall display with double-sided (and paint-safe) removable mounting tape. You can also do the same thing with just a couple of dozen ornaments or string lights and some adhesive hooks. The cool thing about adhesive hooks is that there’s no drilling required and no damage to painted walls. Got a tall-ish bucket or an umbrella stand? Use it for the base of your tree-shaped cards, ornaments or lights. Simple ideas like these aren’t just space-savers and time-savers, they’re money-savers too. And for a first-time homeowner, that’s always a good thing. Establish a color theme. If you have a collection of all-white vases, add fresh greenery or flowers and set them on your dining room table. Put all-red candles in your votives and hurricanes. Follow the “rule of three” or “rule of five.” According to designers, you should always display objects in odd numbers. Never two or four. Ever. Mix it up. Play with tall and short, thin and wide, round and square objects–an eclectic grouping of anything is interesting and provides maximum impact. What’s old is new. Can’t decide on whether to set out your Grandmother’s ornate silver heirloom candleholders or your shiny new modern ones? Don’t choose–show both off on a mantel. DIY, sort of. Spray paint geometric wooden trees or pine cones, wrap small empty boxes with holiday paper and ribbons–make them part of a tablescape or centerpiece. Take your decorating skills outside. 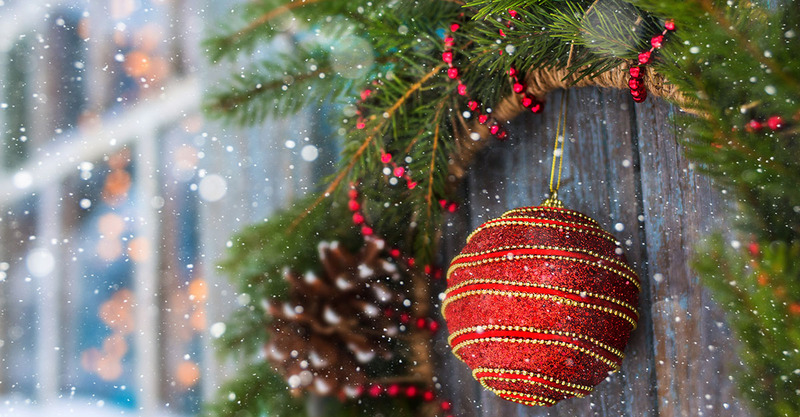 If you don’t have the time or don’t want to decorate inside, hanging a seasonal wreath on your front door is the simplest thing you can do–and it’s so welcoming. Like trees, they’re available in styles from mid-century modern to country rustic to whimsical. And in a variety of materials–wire, straw, ribbon, ornaments, pine cones, jingle bells, citrus fruit, candy canes, you name it. Got a porch? Bring out your summer planter and plant a real 3-foot arborvitae or topiary and some ribbons. Depending on where you live, it could last through the winter to be transplanted in the Spring–as long as you keep it watered. Grab your outdoor metal and glass lanterns and add some battery-powered LEDs or fill them with a shiny assortment of ornaments. Line your walkway with them or set them on your steps. Hang some meteor lights from a tree, snowflake lights from a roofline, or string lights along your hedges. Before you do anything, grab a hot toddy or some hot chocolate, a warm coat, and set out for a leisurely stroll around the neighborhood for some more inspo. You may see a color scheme you love. Or a laser light project that’s cool. Who knows, if you’re really lucky, you may even see a larger-than-life plastic snowman family along the way. Cheers! 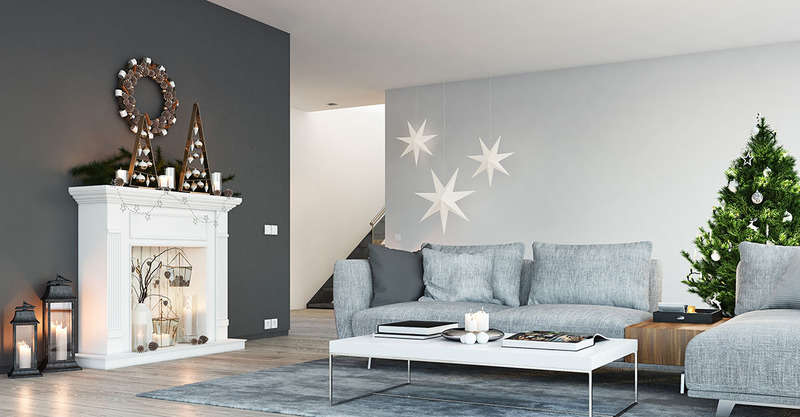 Holiday decorating is the key to a happy home.